Celebrate that you've found this fantastic item! The 17 oz. 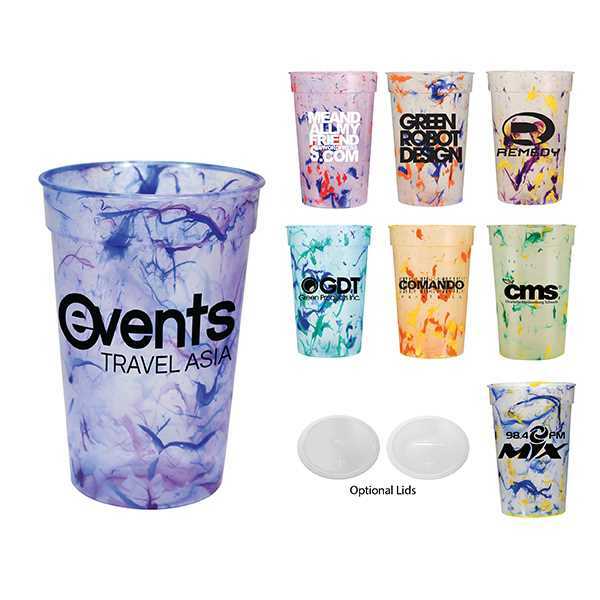 Confetti design Stadium Cup is made with durable plastic featuring a unique abstract design. Choose from a variety of fun designs to feature as your next giveaway. This awesome item makes a great addition to fundraising or charity functions. Sporting events and bike races are both great choices. There are 2 styles of optional lids available for this American-made product. Hand wash only. Size: 3.4375 " x 5 "
Imprint Size:3-7/8" W x 3" H per side. WRAP 8" W x 3" H. Note: Due to the nature of the product, the "confetti" pattern on each cup is different. We recommend bold type and graphics in all ad copy. Fine lines, fine type, and intricate logos may not be easily read. Ship Weight:Boxes are subject to "Dimensional Weight" charges.